Eventually I would find some non waiting stacks but it was not clear if these were the most expensive ones and why. The problem here is that most people are not aware that the actual drawing happens not in user mode but in an extended kernel space thread. Every time you wait in NtUserWaitMessage the thread on the kernel side can continue its execution but you cannot see what's happening as long as you are only looking at the user space side. 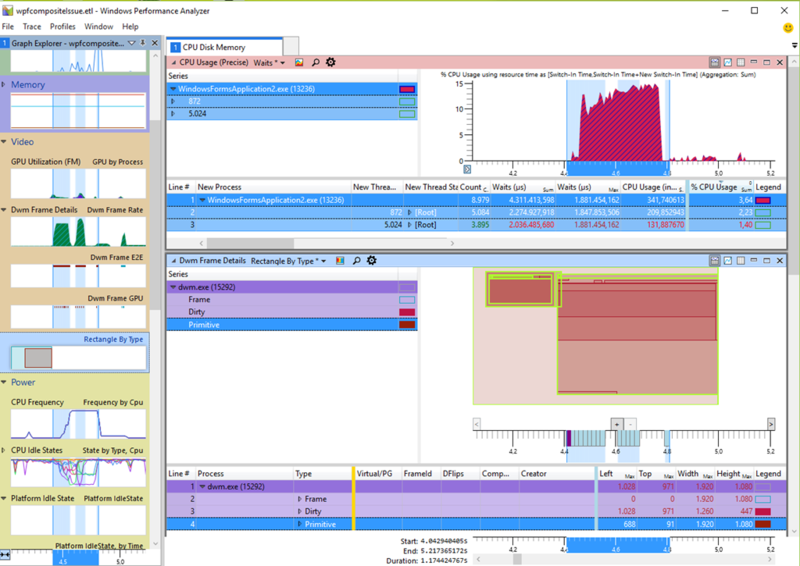 If debugging fails you can still use a profiler. It is about time to tell you some well hidden secret of the newest Windows Performance Toolkit. If you record profiling data with WPR/UI and enable the profile Desktop composition activity new views under Video will become visible when you open the trace file with WPA. Most views seem to be for kernel developers but one view named Dwm Frame Details Rectangle By Type is different. It shows all rectangles drawn by Dwm (the Desktop Window Manager). WPA shows not only the flat list of updated rectangles and its coordinates but it draws it in the graph for the selected time region. 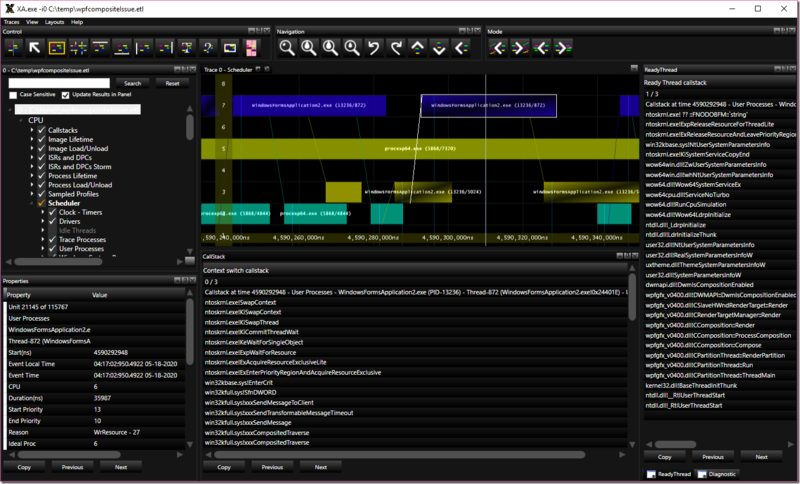 You can use this view as poor mans screenshot tool to visually correlate the displayed message boxes and other windows with the performed user actions. This way you can visually navigate through your ETL and see what windows were drawn at specific points in your trace! 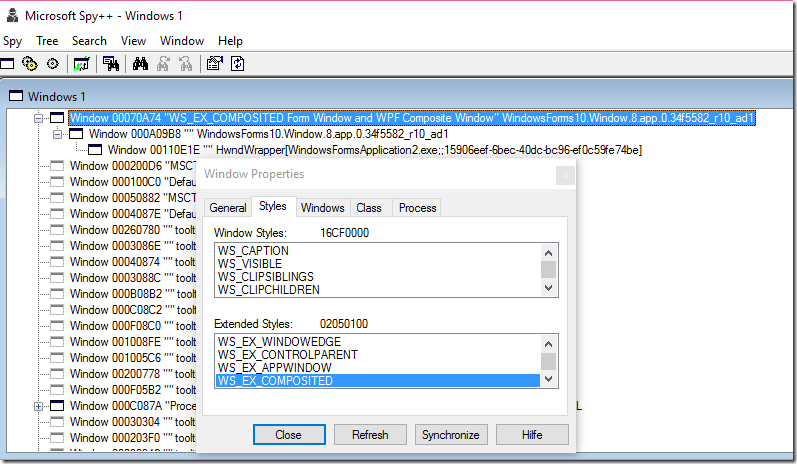 it turned out that the Windows Forms window had the WS_EX_COMPOSITED flag set. I write this here as if this is flat obvious. It is certainly not. Solving such problems always involves asking more people about their opinion what could be the issue. The final hint that the WinForms application had this extended style set was discovered by a colleague of me. Nobody can know everything but as a team you can tackle pretty much any issue. A little googling reveals that many people before me had also problems with composite windows. This flag does basically inverse the z-rendering order. The visual effect is that the bottom window is rendered first. That allows you to create translucent windows where the windows below your window shine through as background. WPF uses such things for certain visual effects. That is enough information to create a minimal reproducer of the issue. All I needed was a default Windows Forms application which hosts a WPF user control. The complete zipped sample can be found on Onedrive. Hosting window must have set the WS_EX_COMPOSITED window style. WPF child window must use composition. WPF child window must use software rendering. 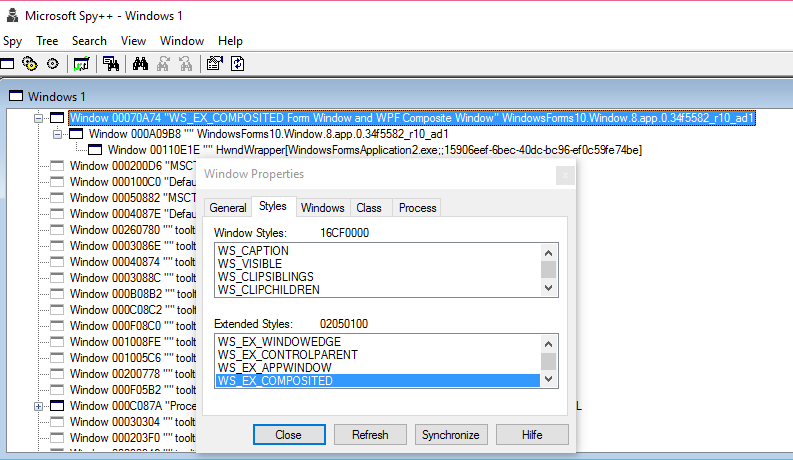 After was found the solution was to remove the WS_EX_COMPOSITED window style from the WinForms hosting window which did not need it anyway. The problem was solved but it is interesting to see the thread interactions happening while the high CPU issue is happening. For that you can use a new tool of MS named Media Experience Analyzer (XA) which was released in Dec 2015 but the latest version is from Feb 2016. If you have thought that WPA is complex then you have not yet seen how else you can visualize the rich ETW data. This tool is very good at visualizing thread interactions in a per core view like you can see below. When you hover over the threads the corresponding context switch and ready thread stacks are updated on the fly. If you zoom out it looks like a star field in Star Trek just with more colors. When should you use WPA and when Media Experience Analyzer? I am having a much easier time in WPA to identify my process with the table and color encoding. In XA you always need to hover over the data to see it actual value. A killer feature in XA would be a thread interaction view for a specific process. Ideally I would like to see all threads as bars and the bar length is either the CPU or wait time. Currently I can only see one thread color encoded on which core it is running. This is certainly the best view for device driver devs but normally I am not interested in a per core view but a per thread timeline view. Each thread should have a specific y-value and the horizontal bar length should show either its running or waiting time (or both) and with a line the readying thread as it is already done today. If you press Turn Symbol Off while is still loading it crashes. The ETL file loading time is very high because it seem to include some private MS symbol servers where the UI hangs for several minutes (zero CPU but a bit network IO). UI Redraws for bigger (>200MB) ETL files are very slow. Most time seems to be spent in the GPU driver. Spelling error in Scheduler view: Drivers, Processes, Threads per Core with Reaady threads. XA certainly has many more features I have not yet found. The main problem with these tools is that the written documentation only touches the surface. Most things I have learned by playing around with the tools. If you want share your experiences with WPA or XA please sound off in the comments. Now stop reading and start playing with the next cool tool!